Today's Draw Classic*: The Four of Wands from the Oracle Tarot by Lucy Cavendish. You work, you take care of your responsibilities, but do you ever stop long enough to just enjoy life? Do you ever, on a beautiful day, just sit in the hammock and do nothing? If you could be doing anything else right this moment, what would that be? 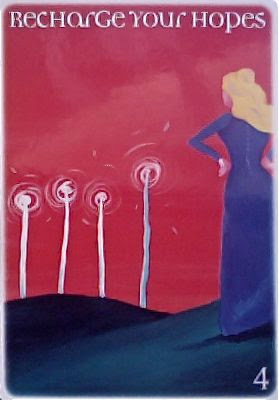 The Four of Wands is traditionally about celebration or some sacred or happy event. Usually there has been an initial victory or win of some sort. We know more work is on the way, but now is a time to honor that win. This card holds true to that meaning, but also adds a different flavor to it. Lucy Cavendish calls it "Recharge Your Hopes". As you reach a goal or end of a life stage, your instinct may be to move on to the next thing. But this cards tells you to take time to honor what you've accomplished, instead. And while you're taking the time, use it rest and reinvigorate, too. Celebrate. And relax. You can think of your next goals when you return. Now is the time to recharge your hopes. Somewhere along the line we got this idea that we always have to be doing or producing. We become so caught up in our day to day lives that we totally neglect the sweet nectar we work so hard to enjoy. We spend Sundays worrying about Monday. We go on vacations and cram them full of a "to do" list. Or we go get a massage and, while laying there, tick off all the other things we have to accomplish that day. We lose ourselves in work five days a week....for what? Yeah, yeah...possessions are nice. But when do we ever lose ourselves in relaxation and enjoyment? When do we ever let go enough to be right in the present moment? I had a yoga teacher many years ago who would start each class by saying "put your to-do list and worries aside. For the next hour, there's nothing you can do about them anyway. They will be waiting for you when you leave. But this time is just for yoga." What he was saying was to be in the moment. Because that's the only place where rejuvenation begins. So many people *think* they live in the moment because they're doing a million things at once. But if you're thinking of the next thing you need to do or your child's science project that's due next week or something someone said to you yesterday, you're not in the moment. You'll know you're in the moment when you're so absorbed by the task at hand that the concept of time completely slips away. Being in the moment while picking up a prescription at the drug store can feel like a vacation in itself, compared to the usual clusterfarq we usually have going on in our mind. But what if...and I know this is a stretch...what if we were actually in the moment when we were doing something we LOVE? Every once in a while I have to stop myself and say "what do you do all this for anyway?" When we did we become worker ants instead of queen bees? Is it a holdover from the days we had to hunt and forage and scrape for survival? What is the point of the lovely house, the weekend getaway and all the stuff if we are never "present" to enjoy it? I'm getting together with an amazing group of ladies this weekend*, all of whom share my loves of tarot and the outdoors. Our big plan? To giggle. Nothing more. Well, we're going to do a ceremony. But mostly, I think, we'll giggle. Whether it's for an hour or the entire weekend, what do you have planned where you can just relax, enjoy and be in the moment? And don't say "an hour? What do you think I am, a princess?" Trust me, the dusting can wait another week. Really, it can. Instead, what can you do to relax, clear your mind and just....enjoy?